The 2018 New England Saltwater Fishing Show was another major success. The annual three day event drew around 15,000 men, women and children to see the biggest names in rods, reels, boats, lures, charter captains and the newest fashions. Produced by the 7,500 member strong RI Saltwater Anglers Association, this year was exceptionally busy. Elisa and Matt from Snug Harbor dominated one end, selling pretty much everything you’d need to get on the water while on the other end, On The Water magazine sold subscriptions and tickets to the Striper Cup with their excellent catch and release division. Peter Jenkins held court across from them, with a glass display of the best of the best and racks of fly and surf gear from his Middletown shop, The Saltwater Edge. Just a few booths over was Bill Hurley selling his line of amazing soft plastics. Block Island’s Andy Fletcher was there, talking about summer stripers and island rum. That’s southern island rum, not the kind Block Islanders might possibly have run in fast boats to help ease those long winters. Representatives from RIDEM helped sportsmen with a new electronic licensing system while Environmental Police Officers answered questions about their role preserving our resources. The new owners of Al’s Goldfish Lure Company were there. Prior owner Mike Lee purchased the iconic lure company several years ago, brushed it off and restored the shine to a classic line of American fishing history. Mike always respected the company’s history and feels like Jeff and Mandy DeBuigne are the perfect pair to take the company even further. Like the lure, their booth was simple and effective and fishermen scooped them up quickly as a sure sign of Spring. Designed for stripers and bluefish, their new Saltwater Series are quickly effective for attracting the attention of lethargic bass hovering in cold Spring waters and aggressive, feeding keepers in salt ponds and off the beach. Surfcasters more accustomed to long or bulky plugs are taking notice of the natural, attractive swim pattern that casts a country mile. We wish them all the best and hope to see both of them in the Ocean State this summer. The Goose Hummock team relentlessly cast Daddy Mac lures into the giant water tank and I’m pretty sure they splashed people just for the fun of it. Well done. Cliff from the Narragansett Surfcasters was seen shopping for bargains. He’s in charge of keeping the clubs’ cupboard stocked with lures, reels, lines and bags for monthly raffles and giveaways as well as the charitable events they support. “You don’t mind crowding your friends,” Cliff said, referencing how generous members are with advice, tips and more importantly, sharing the right rock or cove when the fish are in big. Cheers to that excellent club. The Herring Alliance’s Jeff Taylor helped visitors understand just how important forage fishes are for the ecosystem and just how much damage commercial trawlers can do to stocks in short order. He asked recreational anglers to sign a petition to “Prohibit midwater trawl gear in a buffer zone that extends 50 miles from shore in Southern New England waters adjacent to Massachusetts, Rhode Island and Connecticut.” It also called for closing the Gulf of Maine to the same gear and adopting a “control rule with a target amount of herring left in the water that is enough for predators and a minimum threshold amount of herring below which herring fishing must stop.” If you fish for pelagics, keep hoping to land that fifty or want to lean over a bridge to watch buckies swimming upstream in the most amazing and humbling display of Nature, consider supporting their work or signing the petition. Some hats looked like they could have used an oil change. Hooks on hat visors were again a big item while one guy proved less is more by wearing a faded blue shirt with a white box on the front, holding the word FISH. A few men carried long handled purses of pink and blue umbrella rigs, showing no sign of concern. There was a surprising amount of men wearing hair gel and/or earrings; visors apparently are making a comeback. One woman’s shirt announced she was, “Light & Salty” while nearby a fisherman wore a hat with “Ditch Troll” on the top. I have no idea what either meant. The show’s hottest fashion accessory was the long sleeve drab green shirt with a single strip of camouflage down each sleeve. My best guess is the strip would hide a hunter’s arm while he slept in a tree stand, head in hand.
. The show always offers ‘Gansett at the bar and lots of plastic gets tossed around, especially next to those apparently confusing recycling bins so maybe it’s time to bring back the waxed paper cup. They worked just fine for Led Zeppelin shows and countless Bruins games plus they’ll fade away without consequence in a bursting Johnston landfill. 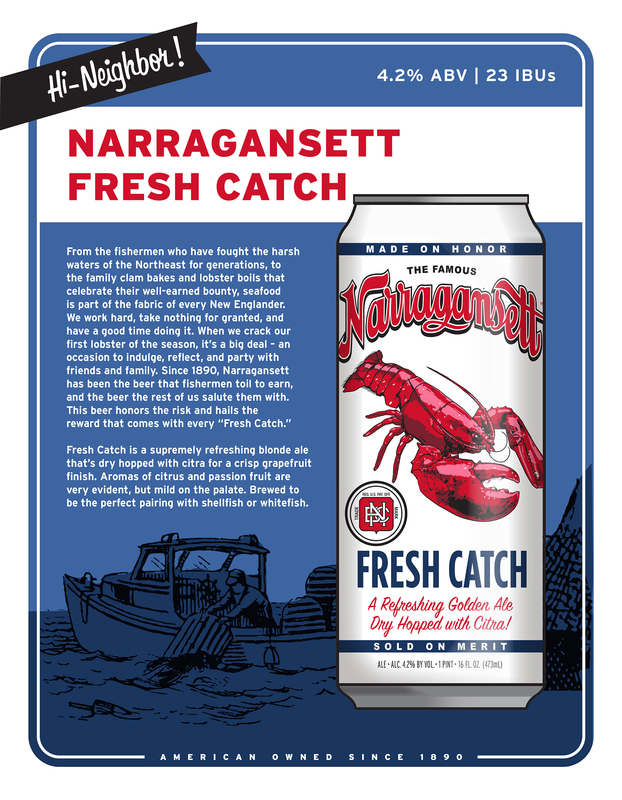 Since everything old eventually is new again, their return will bring back fond memories of fishing from beach buggies, swordfish off the island, many years of the Saltwater Fishing Show and the beer that made Narragansett famous.